The 1990s were a bloody time for big cities in the United States, as nationally, violent crimes — a category that includes murders, rapes, robberies and aggravated assaults — on a steep increase for decades, hit levels not seen in modern times. Here, too. Minneapolis made the international news in the '90s for high crime, with headlines like “From Hicksville to ‘Murderapolis’ — Minneapolis was known for its slow, polite people straight from Garrison Keillor stories. Now the murder rate is worse than New York’s” (this from the U.K.’s The Guardian). Things were also bad that decade for St. Paul. But it didn’t last. Here as in many cities, as the new millennium approached, crime rates began to decline, a fact scholars attribute to things like tough-on-crime laws, which put many offenders behind bars; the end of the crack epidemic; the growth of police forces; the rise of medications for attention-deficit disorder; and tightened regulations on lead paint (studies have found lead exposure to cause aggressive and impulsive behavior, and its prevalence has been connected to crime). While often cited as contributors to the drop in crime, these theories focus on external factors and ignore the role communities themselves played in tackling crime. From turning abandoned lots into parks and gardens to businesses helping to pay for security, and social programs that help decrease crime involvement among young people, the actions taken by organizations within communities should have, in theory at least, contributed to the drop in crime. Last month, New York University associate professor Patrick Sharkey and doctoral students Gerard Torrats-Espinosa and Delaram Takyar put some numbers behind the theory, publishing research in the American Sociological Review that connects the boom in community-focused nonprofits during the 1990s and 2000s, in cities across the U.S., including in Minneapolis and St. Paul, to the crime decline. What they found is pretty striking: In more than 20 years across 264 cities, for every 10 additional nonprofit organizations focused on things like reducing crime, mitigating violence and building community per 100,000 residents, murder rates went down by 9 percent. 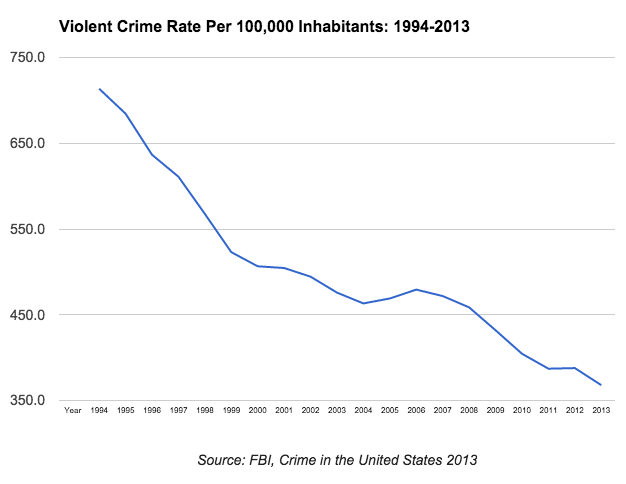 Violent crime went down by 6 percent, and property crime went down by 4 percent. The study’s model accounts for other things that occurred around the time nonprofits boomed and crime declined, such as an increase in police force sizes and higher incarceration rates. It focuses on the addition of community nonprofits — those that work in preventing crime, neighborhood development, substance abuse prevention, job training and workforce development, and activities for young people — and not on nonprofits that work in areas including the arts, medical research and the environment that would be less likely to affect crime rates. The study also controls for the fact that nonprofits that have an effect on violent crime rates are more likely to spring up in more crime-ridden areas. While the results varied across cities, in general, the cities with the largest increase in community nonprofits saw the largest drops in crime. New York City, for example, which added 25 community nonprofits for every 100,000 of its residents between 1990 and 2013, saw a larger than average crime rate drop. Since the most recent year of study in the research is 2013, it doesn't account for an uptick in violent crime nationally in the last two years. In both Twin Cities, the number of community nonprofits per 100,000 people more than tripled in the 23 years between 1990 and 2013. Both cities saw bigger increases in number of nonprofits than the study-wide average across cities in that time period. Minneapolis in 1990 had 29 community nonprofits per 100,000 population in 1990. In 2013, that count was up to 94 per 100,000 people. That increase in nonprofits coincides with a crime drop: In Minneapolis, the murder rate peaked in 1995 at 26 per 100,000 residents, then began a gradual decline. In 2013, the murder rate was nine per 100,000 residents. Conditions were similar in St. Paul: In 1990, St. Paul had about 28 community nonprofits for every 100,000 residents. By 2013, it had 91 per 100,000 residents. After peaking in 1992 at 12 deaths per 100,000 people, the murder rate dropped to five murders per 100,000 people in 2013. The researchers aren’t suggesting every nonprofit plays a role in reducing violence, but they write that there’s evidence that organizations that do things like summer jobs for teenagers, in-school programming, cognitive behavioral therapy and tutoring can have an effect on crime rates. In some cases, nonprofits work fairly directly to try to help lower crime rates in the Twin Cities, said Stephanie Jacobs, the director of the Public and Nonprofit Leadership Center at the Humphrey School of Public Affairs. Then there’s restorative justice nonprofits, like Restorative Justice Community Action and the Seward Longfellow Restorative Justice Partnership that work to start dialogues between offenders and their communities and create networks of support. “There have been studies that have shown those help with recidivism and other kinds of things where those youth are less likely to commit crimes in the future,” Jacobs said. But there are also services nonprofits provide in Twin Cities communities that might indirectly lower crime rates. “There’s this other notion I think is becoming more associated with nonprofit work in general that crime, like many issues that face communities, is not isolated … it’s connected to housing, it’s connected to mental health, it’s connected to all kinds of things,” Jacobs said. Those are the areas that St. Paul nonprofit Face to Face, geared at homeless youth, works in. The nonprofit provides housing services, medical and mental health care to more than 3,000 young people — age 11 to 24 — each year. It operates a drop-in center in downtown St. Paul and has a rent subsidy program and a place for young people to search for jobs. Further study is needed to understand what type of work nonprofits do is most effective at reducing crime, said Takyar, a co-author of the study. But the results do point to some possible real-world lessons to be learned, especially as crime rates in some cities are rising again: More community-based efforts might actually help reduce crime, which costs lives and livelihoods, particularly in low-income communities. “What it suggests is there’s definitely a need to focus on internal actors, and we’re at a point now where there have been conversations about cutting funding for things like nonprofits. For us, the big takeaway is making more funds available to these kinds of organizations could potentially have beneficial effects,” Takyar said. Greta Kaul is MinnPost's data reporter. She can be reached at gkaul@minnpost.com. Submitted by Adam Miller on 11/28/2017 - 11:11 am. Yes, we used to add a neurotoxin to gas, for very little reason other than it was profitable to sell and easier than engineering better internal combustion engines, which was then spewed out across the world. Turns out with a 20 year or so time delay, the rise and fall of violent crime correlates pretty closely with how much lead those cars emitted. Submitted by Frank Phelan on 11/28/2017 - 01:08 pm. Yep, it was lead. Conservatives like to tout tough on crime things like stop and frisk & minimum sentences. Liberals like to say it was social spending. Neither wants to admit it was lead. So why is it that everywhere around the world, when lead is removed form gasoline, there is a drop in violent crime 20 years later? This has happened without exception, in every country. And reporting on the historic drop in crime without even mentioning leaded gas is lazy reporting.The data is out there, and no hard to find. Submitted by Pat Terry on 11/29/2017 - 11:36 am. Legalized abortion and better contraceptive access also contributed to declining crime rates, but no one wants to talk about that. I am surprised, though, that the removal of leaded from gas doesn’t get more attention. The correlation – across different states and different countries – is very strong, and the science backs up the harmful effects of lead. Maybe people would take environmental laws more seriously if you could connect it to things like violent crime. Submitted by Frank Tisdale on 11/29/2017 - 04:31 pm. Most of this can be credited to booming economics in the 1990s and early 2000s, tho there are other factors related to demographic shifts, aging populations, etc. Pretending that “not-for-profits” has anything to do with the nationwide fall in crime is a desperate attempt to make carts follow horses. Most of these non-profit orgs only appear in the wake of greater economic prosperity, and at best are a coincident factor, not a ’cause’. You’d think someone whose job is “Data reporter” should be capable of some statistical skepticism, and acknowledge that correlation and causation are two entirely different things.